The GCC Fair is the largest "conclave" held on the northern Gulf Coast each year, with attendees having the opportunity to learn from a very diverse group of anglers and tiers, with specialties ranging from mountain trout to offshore fly fishing. - Friday activities include specialty classes and casual dinner that evening at the Yacht Club with award presentations, auction featuring one-of-a-kind items, and more. - Saturday begins with breakfast at Gulf Coast Research Lab, followed by programs, fly tying, vendor exhibits, casting, silent auction and raffles. All classes and instruction are FREE! For IFFF members, dorm suites available at the Research Lab for $15 or $22, first come, first served. Holiday Inn Express also has special rates for $77. For complete details on this great event, with contact info, go to www.gulfcoastfff.org. The next meeting of the Kisatchie Fly Fishers will be on Monday, August 24, at the Rapides Westside Library in Alexandria. Time is 6:30pm. The public is welcome. For this meeting, we’ll have Chris Patterson as our guest speaker. Chris was hired back in March as the new Parks and Recreation Director for Alexandria. A position he had held the last six years in Brownsville, Texas. Under Chris' leadership, the Brownsville department grew from 16 parks to 32 parks and youth recreational programs were expanded to several thousand youngsters. Since joining AREC, Chris has initiated a series of activities to get kids outside and showing them more to life than video games and Facebook pages. Chris will talk about some of his programs and do questions and answers. Chris will also address a hot topic on the minds of KFF members: can Alexandria have winter stocking of rainbow trout like they do in Baton Rouge, Gonzales, and Lafayette? You'll have to attend to find out! The August, 2015 issue of "Lines and Leaders", the newsletter of the Kisatchie Fly Fishers, is now online in PDF format (901kb). Click here to download. 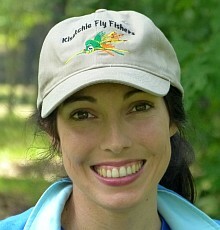 Contraband Fly Fishing Expo this weekend! Fly Tying, Casting Demos, Lure Exhibits, Auctions / Raffles, Food and Refreshments, Equipment Displays and more! Also, the drawing for their Kayak Raffle. Tickets will be sold during the event up until the drawing. Our next fly tying session will be Monday, August 17, at the Rapides Westside Libary in Alexandria. Time is 6:30pm. Coming soon! Great fall fishing for bass and redfish. Redfish will be feasting on storm minnows, while bass will be chasing shad. 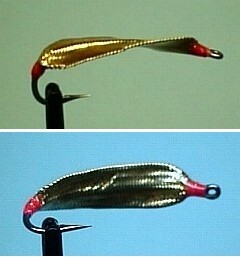 There are several great patterns that imitate baitfish. One of the most effective is the Coma Spoon. Originated by KFF member Glen "Catch" Cormier, this fly is a "twist" on the popular spoon fly. Unlike traditional teardrop spoons, the Coma Spoon - based on propeller science - sinks faster without weight, and can be retrieved at a fairly rapid pace without skimming at the surface. For this session, we'll tie the Coma Spoon and give options for this fly. Bring your tools if you have some, if not, the club has a few sets for use during these sessions. Materials will be provided.